A while back I posted http://beyondmydaw.com/forum/showthread.php?tid=225 which is about Monitor FX in different DAWs. What I described for Studio One works fine, but there is a better way. If you follow this thru you'll also get exposure to some other cool stuff you might not have already seen. 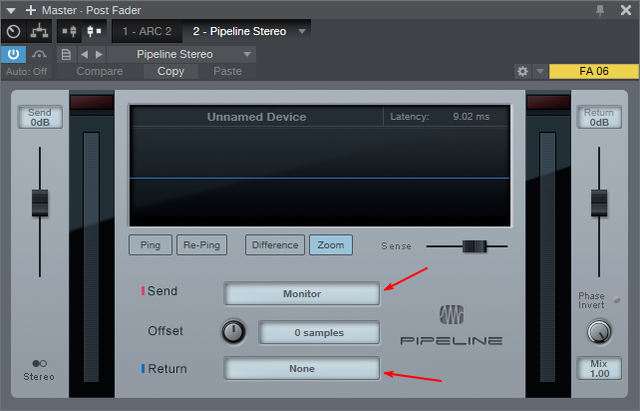 1) Create a new monitoring out routed to the hardware outs your monitoring gear is connected to. 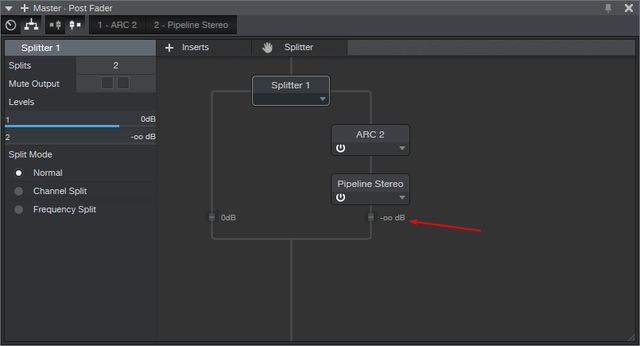 In the Master Channel Editor, add a Splitter and your Mon FX, with an instance of Pipeline at the bottom of the chain. Lastly, configure Pipeline as shown, with Send set to the previously configured Monitor output and Return set to None. Rock and Roll!! 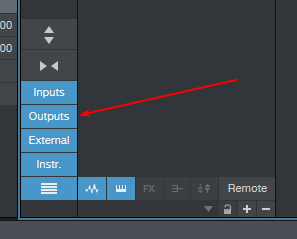 Now you can have Master FX in the Master Inserts with no need to bypass for mixdown, and no extra buses to futz with. Complete with listening level control that has no effect on mixdown level. EDIT: Added monitor out visibility. I have also changed my config by adding ARC2 to the Monitor Inserts, leaving only the Pipeline plug in the Master Post bin. This way I can add/change settings for monitor FX in the Monitor strip, which works better for my head. Thanks Bob. Great info. I am a big fan of ARC2 so this is perfect! Awesome stuff Bob. thanks for the info. (03-23-2018, 06:03 PM)BobF Wrote: A while back I posted http://beyondmydaw.com/forum/showthread.php?tid=225 which is about Monitor FX in different DAWs. What I described for Studio One works fine, but there is a better way. If you follow this thru you'll also get exposure to some other cool stuff you might not have already seen. Here you. Sorry 'bout that. postimg did a domain change and a few things got goofed up. While in theory, I love this idea, I don't have an ARC2, so maybe that is the issue, but I just put in a simple reverb in it's place and there is still every slightly a lag that makes tracking vocals no fun at all. I think I'll stick to the reverb bus for now. (05-14-2018, 02:37 PM)Midiboy Wrote: While in theory, I love this idea, I don't have an ARC2, so maybe that is the issue, but I just put in a simple reverb in it's place and there is still every slightly a lag that makes tracking vocals no fun at all. I think I'll stick to the reverb bus for now. My use for this is for mixing. ARC is room correction software. I haven't noticed any lag, by I don't sing No problem tracking guitars for me.